Photo: Oyer and Schaefer: What Drives Lawyer Layoffs at Large Firms? The Georgetown conference on the state of BigLaw continues, and it does not sound like the panels are getting any rosier in their outlooks.Stanford business professor Paul Oyer talked yesterday about his recent study, which found that recent grads from top 10 law schools are more likely to be laid off from a big firm than their fellow associates and that the younger you are, the more likely you are to go. The Blog of the Legal Times has full coverage of the talk. Oyer, who co-authored the study with University of Utah business professor Scott Schaefer, also found that attorneys were more likely to be laid off if there was not a partner in their office that went to the same law school. Their study also found women took bigger hits, as did securities lawyers in New York. BLT: Oyer routinely examined the Web pages of about 300 large law firms. To find which lawyers may have been laid off, Oyer compared snapshots of firm Web pages before and after announced layoffs. He attributed other departures to lawyers leaving voluntarily. Oyer acknowledged that the data isn’t perfect, but said he was able to make some interesting assessments about law firm departures. They also used the Law Shucks Layoff Tracker and admitted that their methods were not totally scientific — firms have not all confirmed the numbers and some counted as laid off might have left voluntarily and vice versa. Oyer and Schaefer’s, paper, “What Drives Turnover and Layoffs at Large Law Firms?” looked at 285 big firms. That’s a pretty big group, and one that would include a lot of regional firms that tend to have fewer Top 10 grads. 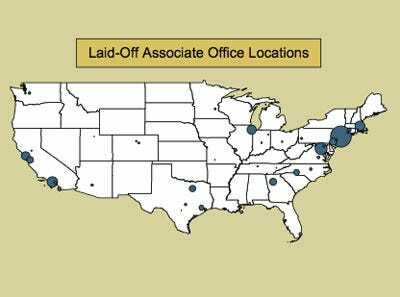 We know that firm layoffs were concentrated at the largest firms in the largest cities. For their part, the authors note that the fact that Top 10 grads appeared to suffer more in the job market went against their hypothesis and that the answer to why that is true could not be explained by looking at the numbers. Bottom line: we’re not too sure that those sitting in Top 10 classrooms should consider themselves worse off than those further down the ranks. On the other hand, one can look at where the layoffs happen and ask themselves if they might want to practice in Omaha. A PDF of the paper can be accessed here.